A man who sold VPN software via a website has been sentenced to nine months in prison by a Chinese court. The decision, handed down earlier this year but only just made public, notes that the software supplied by the man allowed the public to circumvent China's Great Firewall while granting access to foreign websites. Back in January, China’s Ministry of Industry and Information Technology announced that due to Internet technologies and services expanding in a “disorderly” fashion, regulation would be needed to restore order. One of the initial targets was reported as censorship-busting VPNs, which allow citizens to evade the so-called Great Firewall of China. Operating such a service without a corresponding telecommunications business license would constitute an offense, the government said. The news was met with hostility, with media and citizens alike bemoaning Chinese censorship. Then early July, a further report suggested that the government would go a step further by ordering ISPs to block VPNs altogether. This elicited an immediate response from local authorities, who quickly denied the reports, blaming “foreign media” for false reporting. But it was clear something was amiss in China. Later that month, it was revealed that Apple had banned VPN software and services from its app store. “We are writing to notify you that your application will be removed from the China App Store because it includes content that is illegal in China, which is not in compliance with the App Store Review Guidelines,” Apple informed developers. With an effort clearly underway to target VPNs, news today from China suggests that the government is indeed determined to tackle the anti-censorship threat presented by such tools. According to local media, Chinese man Deng Jiewei who ran a small website through which he sold VPN software, has been sentenced to prison. 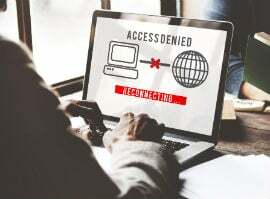 The 26-year-old, from the city of Dongguan in the Guangdong province, was first arrested in October 2016 after setting up a website to sell VPNs. Just two products were on offer but this was enough to spring authorities into action. It’s alleged that the man used several phrases to market the VPNs including “VPN over the wall” and “Shadow shuttle cloud”. The business wasn’t particularly profitable though, generating just 13957 yuan ($2,133) since October 2015. “The court held that the defendant Deng Jiewei disregarded state law, by providing tools specifically for the invasion and illegal control of computer information systems procedures,” the Guandong Province’s First People’s Court said in its ruling, handed down earlier this year but only just made public. For offering tools that enable people to “visit foreign websites that can not be accessed via a domestic (mainland) IP address,” Deng Jiewei received a nine-month prison sentence. News of the sentencing appeared on Chinese social media over the weekend, prompting fear and confusion among local users. While many struggled to see the sense of the prosecution, some expressed fear that people who even use VPN software to evade China’s Great Firewall could be subjected to prosecution in the future. Whatever the outcome, it’s now abundantly clear that China is the midst of a VPN crackdown across the board and is serious about stamping out efforts to bypass its censorship. With the Internet’s ability to treat censorship as damage and route round it, it’s a battle that won’t be easily won. Update: An earlier version of this article stated the decision was handed down by the Chinese Supreme Court when in fact a local court handed down the ruling. The defendant’s full name is corrected to Deng Jiewei.